So you're just starting out as an entrepreneur or maybe you've been in business for a few years, and you've been told that you need to "define your brand." You know that's excellent advice, but you're just not sure what it means exactly, how to do it, or even why you should waste time defining your brand. I mean, your "brand" is just your logo, right? 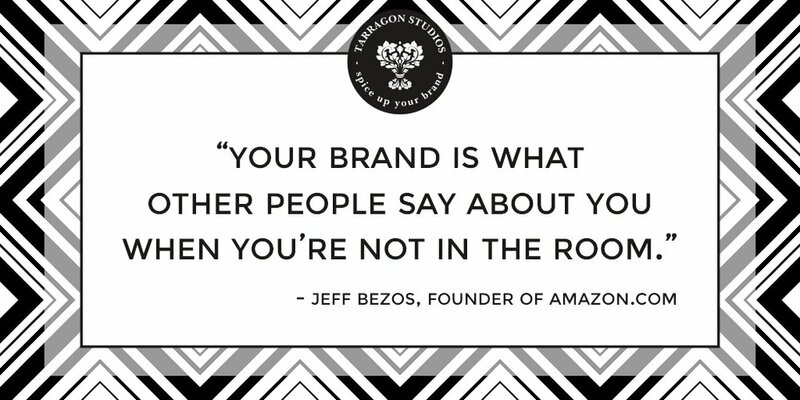 Jeff Bezos, founder of Amazon.com, said it perfectly, "Your brand is what other people say about you when you're not in the room." Your logo, variations, typefaces, color pallet, collateral items, and voice (writing style) all work together to define who your company is in the minds of consumers. Branding is simply creating a set of "rules" (guidelines) for your company, so that you can influence what people think about you and attract your ideal customers. Click here to download your Brand Questionnaire! For better or for worse, we all make assumptions about people, products, or companies based on how they look, sound and "feel." As we grow-up, we encounter many similarities in the world around us. Our minds are excellent at storing and categorizing information and often times form "short-cuts" or "stereotypes" to allow us to access information faster. It's how you "know" when something looks "vintage," "boho," or "Classic." Defining your business and creating your brand will lead you to a set of visuals designed to elicit a particular response from your target audience (or ideal client). For example, if I mention: sun, yellow, flowers, warm; you'd probably start thinking about a pleasant sunny afternoon. This concept of creating a certain expectation from your audience can work in reverse too. Imagine how surprised you'd be to see a man in flipflops, tank-top, and jean-shorts representing his client in a courtroom. Unfortunately flipflops on an attorney is exactly how a mismatched brand looks to your clients - out of place and confusing - not the emotions you want to elicit from your audience. Appearances make quite a difference. Branding is so much more than just a logo or collection of fonts, images and colors you like. It is the outward expression of your business's core values, personality, and flare. The end goal is not just to create something beautiful, but to create something that welcomes your ideal customer. Your business should just look like a perfect fit. Luckily, branding doesn't have to be a grueling, soul searching, agonizing process. I developed this little brand questionnaire to help my clients define and communicate their brand's core values and personality right up front! This guide walks you through the "discovery" phase to inform your decisions in the "draft" and "design" phases. The questionnaire begins with a business overview to take stock of where your business currently is (or where you would like it to be). You may have to do a little research to answer questions about who your main competitors are and what makes you different. Next, we analyze your current (or your ideal) clients. It is important to answer these questions with a real person in mind. In other words, answer them for the client that is most helped by your product/service or who you enjoy working with the most. Finally, we describe your brand or your business. Again think of your business as a person/friend; this will help you give more concrete answers. Think about what your business would wear, how it would speak, and where it would hang out. Once you have finished your questionnaire, read through your answers and pull out adjectives and imagery that stand out to you. Record these in your "notes" section. Congratulations! 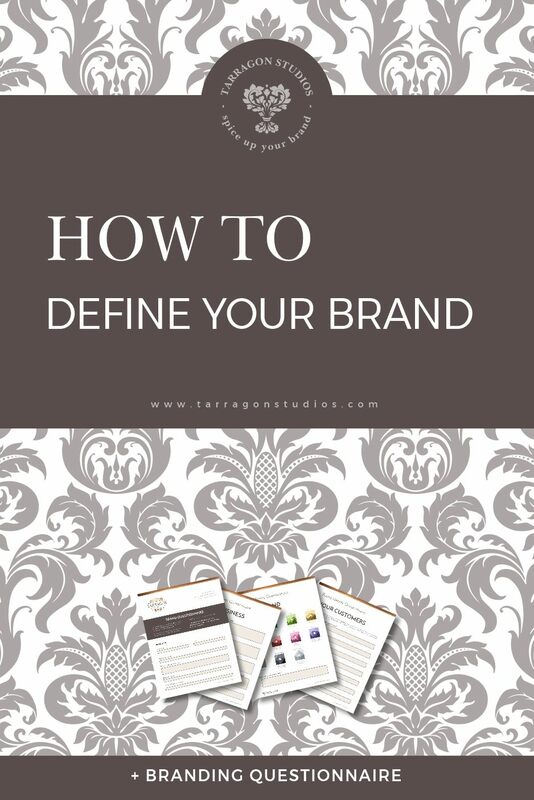 You have just defined your brand! That wasn't so bad, right? Try searching your brands selected values or personality traits paired with the item you need inspiration for. For example: "trustworthy" color or "earthy" logo. Pin as many as possible (I like to see at least 50 pins) and then start looking for similarities that you can build on to create a look that is uniquely "you." Sketch out as many logo designs as come to mind. There are no bad ideas in drafting... you'll weed those out later. In the Design phase you can finish off the process by pulling together all the similarities, finalizing your logo and other collateral items. Create templates for all your blog post titles or social media images. This is the part where you create the design "rules" you'll use to consistently communicate the brand that you just defined during the discovery phase. At the end of the branding process, you will be amazed at how marketing falls into place. You won't have to re-analyze your target market to figure out where to share content; you won't be agonizing over the design of every brochure or ad; you'll just know what to do. And that is priceless. Did you start your business with a brand or develop one on the fly? How has that helped or hindered your business? Sign up with your email address to receive strategic design & business advice, as well as small business news.